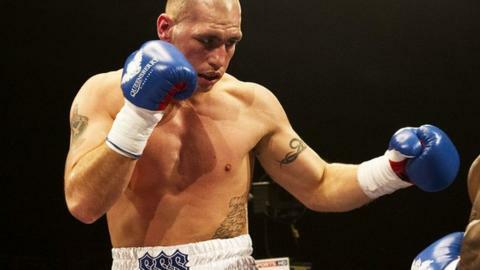 Every sporting career is a journey of sorts, but for Edinburgh cruiserweight Stephen Simmons the miles he has covered are proving to be worth the effort. I first met Simmons two years ago at the re-opening of his former club, Leith Victoria, after its renovation. From the age of 12 he had travelled 50 minutes on the bus each way across Edinburgh to train there. In 2010, he was sparring with the British Olympic team in Sheffield before heading to Delhi for the Commonwealth Games, where he won a bronze as a heavyweight. After the Games, he chose to turn professional, dropping a weight to do so, and he teamed up with Glasgow trainer Billy Nelson at the beginning of 2011. A scaffolding firm's sponsorship helps him with the cost of travelling from the capital to Glasgow every day for training, but his commute often takes him further afield, to England. Speaking after his sixth-round stoppage of Hastings Rasani at Braehead Arena, the 27-year-old said: "I have had great sparring over the past year. "I've been in with three world champions and former champions, guys like Carl Froch, Nathan Cleverly, Enzo Maccarinelli and James DeGale. "They're phoning Billy Nelson because they want good sparring. They phone to see if I'll go down. "It's a privilege to go and spar with them but it's good they are asking me to go." Simmons's size sets him apart from most Scottish boxers, 6ft 7in Highlander Gary Cornish excepted. The norm is for lighter fighters of the stature of Paul Weir, Paul Appleby or John Simpson, for example. But although he fights in the 200lb division, he is feeling very much part of the family at The Fighting Scots gym in Mossend, where Ricky Burns is the star name. "It's a great buzz. We're like best mates," added Simmons. "To train beside a world champion is amazing." The transition from amateur to pro has come easily to him. "People always said with my style I would be suited to the pro game," he continued. "My uncle always trained me like a pro. "As a professional, you need to plant your feet a bit more, you don't rush when looking for your openings. "It suits me much better." The stoppage of Rasani was only Simmons's fourth bout. His debut was also at Braehead, in March last year, where he beat Battersea's Nick Okoth in two rounds. That was followed by points wins over Wales' Hari Miles in London in May and John Anthony at Ravenscraig in Motherwell at the end of the year. "He was a stone and half heavier than me," said a lightly marked Simmons after the fight against the burly Rasani. "I don't like fighting too much over my weight. I like to come down and feel comfortable at my weight and box within half a stone of my ideal weight. "He was stronger than I anticipated but he can't do much when he's walking on to jabs. "I was controlling him with my footwork. "He's a tough old cookie. That was his 96th fight. He doesn't get stopped that often. It was great experience." Simmons is next in action on 12 April in London's Bethnal Green, a 10-round contest against Tony Conquest. "I've not lost a round since I turned professional," he said. "Because I am still fresh in the pro game, it would be good to just keep ticking over so that I can look forward to the British title. "I'm fine as long as I know I'm progressing. "By the end of the year I would hope to be British champion. If not, then the beginning of next year." Simmons will be able to gauge how far along the road to becoming British champ he is when he watches former sparring partner Maccarinelli challenge the holder Shane McPhilbin in Wolverhampton on Friday 23 March.